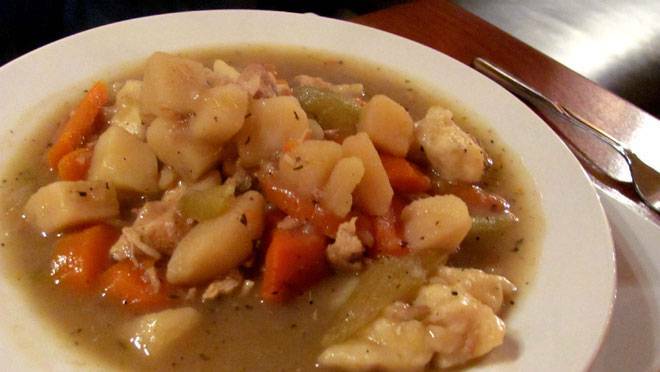 Turkey Fricot is one of the core dishes that make up a traditional Acadian meal. I am of Acadian ancestry, Cormier was my maiden name; so I grew up on potato based dishes such as this one. This is a great one to do post Christmas dinner with all that leftover turkey. Anyhow, we had a frozen turkey carcass from earlier in the year that we were saving to make soup from so. So I prepared that ahead of time by boiling it until a good stock was obtained, then I strained it and sorted through the remains for all the yummy meat. I highly recommend this last step as the very best broth you can ever get comes from boiling the entire remaining carcass, there is just no way to get that flavour from a package. At that point I used the broth and meat and as a soup base in the slow cooker. I added coined carrots, potatoes and slices onions. Then I seasoned it as it cooked with salt and summer savory to taste. That’s it. Voila, a delicious soup for the family to enjoy. Toss it all in and cook all day, easy peasy. Optionally you can add dumplings..or what we called Dough Boys as children. Here is how to do that. Posted on December 5, 2011, in Blogging, cooking, Health, Uncategorized and tagged recipes, slow cooker sundays. Bookmark the permalink. Leave a comment.